Peter Jackson’s ground-breaking Lord of The Rings trilogy transported Tolkien fans straight to the heart of Middle Earth in this epic adventure. Now fans are waiting with baited breath for The Hobbit: An Unexpected Journey. Jackson used some of the most advanced cinema technology to weave the magical tale for the first three movies, and if you’re expecting more of the same (and better!) you won’t be disappointed! Let’s take a look at the cinema technology behind The Hobbit. This time Jackson will be using the latest cinema sound technology, Dolby® Atmos™, which uses overhead speakers in addition to surrounds, creating a natural, realistic sound experience. The sound can move around the theatre to create dynamic effects. The result is a lifelike cinema audio experience that uses up to 64 speakers. But that’s not all… something else has caused a stir about this film. Earlier this year, Jackon screened a 17-minute teaser of the Hobbit for industry insiders (which we were fortunate to attend), with a limited release 48fps version of the movie. It sparked some controversy: not everyone was appreciative of this new breakthrough in cinema technology and some experts argued that this new way of filming spoilt the atmosphere, leaving Middle Earth just looking like a film set. The reality is that it may take some adjusting to this new frame rate. We were absolutely blown away: whilst it takes your eyes a few minutes to adjust, to see what we saw on screen was just absolutely unbelievable. We’ve seen 24fps films on the silver screen for years, and maybe we’ve all grown accustomed to them. Peter Jackson seems to think so, and he expects it to be unsettling for audiences at first before they accept the format. But as the 48fps version will only be showing at a very limited number of cinemas, most of us will just have to take his word for it for the time being! We’ll be welcoming back some of our favourite characters, like Gandalf, Frodo and, of course, Gollum, played by Andy Serkis. This skinny, slimy character has ended up with a surprisingly large following after he was brought to life with a combination of impressive acting, motion capture and state of the art CGI. New Zealanders have understandably been gripped by Hobbit fever. However, they are not alone. If the Lord of The Rings trilogy is anything to go by, The Hobbit won’t fail to impress. Peter Jackson has a knack of being able to use the latest technology to create a wonderful, realistic experience for cinemagoers – we’re definitely looking forward to the movie’s release on 28 November! P.S. The story behind the floating Gollum picture? 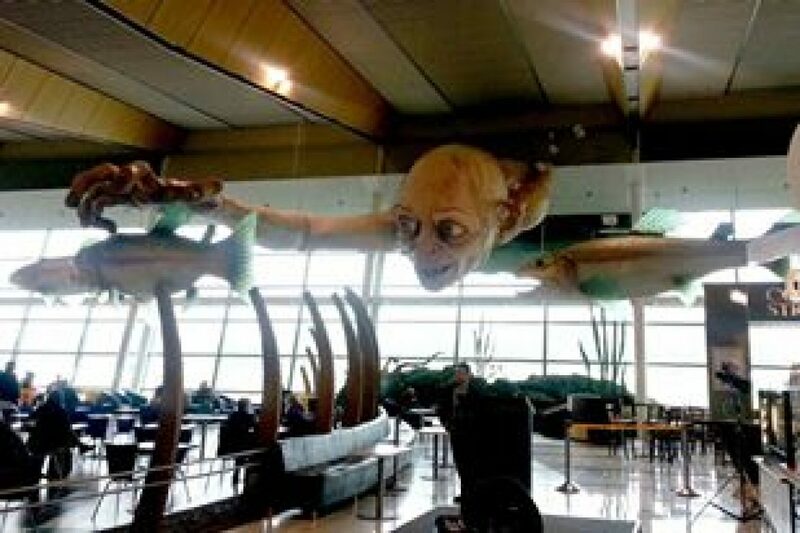 Well, you may know that we’re doing the refurb/ fitout of the cinema hosting the world premiere of the Hobbit in New Zealand… And this is what welcomed us after arriving at Wellington Airport!